Voted the 24th greatest film of all time in the 2012 Sight & Sound Critics poll. Carl Theodor Dreyer's beautifully photographed tale explores the religious intolerance and familial tensions within a Danish farming family. Carl Theodor Dreyer made only 14 full-length feature films in a career spanning almost 50 years, but they are among the most intensely wrought works in the history of the cinema. Dreyer's films have always been much admired by critics, theorists and filmmakers for the way in which they generate a luminous beauty with artfully constructed sets, deep respect for period detail and a masterly ability to conjure up an empathy for physical and emotional suffering. 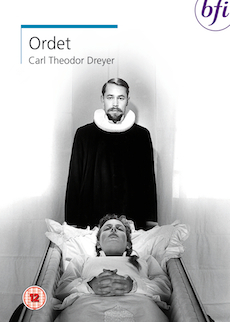 Based on a 1932 play by Danish playwright and Lutheran country priest Kaj Munk (1898-1944), Ordet is a tale of miraculous resurrection brought about by human love. It is an extraordinary expression of spiritual optimism that is neither sentimental nor pious. Religious intolerance and family tensions within a Danish farming family lie at the heart of the film, which explores the clash between orthodox religions and true faith. Dreyer achieves its powerful effects in deceptively simple ways, and has produced, in its closing moments, one of the most extraordinary scenes in all cinema. As well as directing feature films, Dreyer was involved in 13 state-commissioned documentaries and short films up to 1956, on subjects ranging from art and architecture to road-safety. Two of his rare short films are included on this DVD. Ordet Og Lyset (Helga Theilgaard, 2001, 33 min): a documentary about cinematographer Henning Bendtsen and the making of Ordet. Thorvaldsen (Dreyer, 1949, 10 min). Storstrom Bridge (Dreyer, 1950, 7 min).